Don't leave the revelation, wisdom and divine insight of the 2010 International Faith Conference IFC) at the conference. 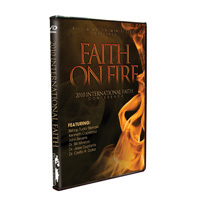 Relive the excitement and delve even deeper into the revelation and anointing of the 2010 IFC. Featured Speakers Include: Bishop Tudor Bismark, Kenneth Copeland, John Bevere, Dr. Bill Winston, and Dr. Creflo A. Dollar.